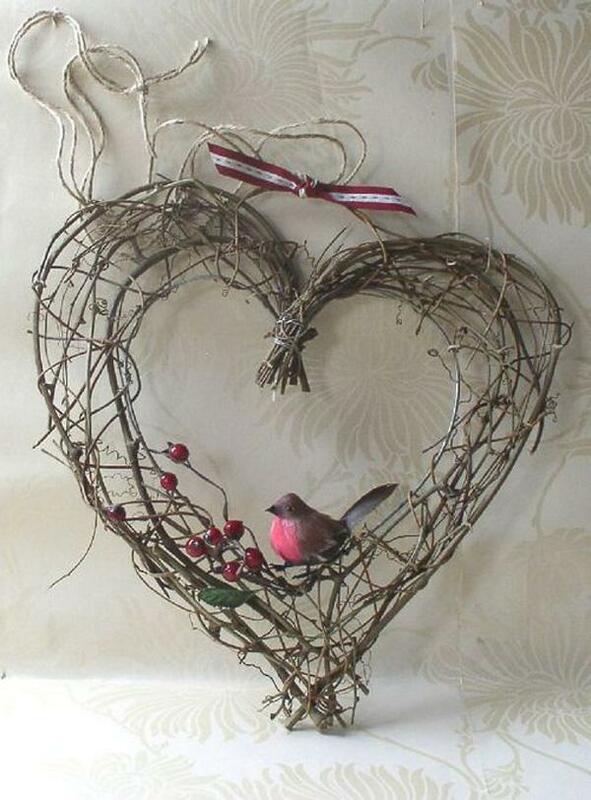 A wood inspired heart shaped craft using twigs to shape the symbol. Wires and ropes are used to hold the shape as well as the intricate and overlapping details inside the heart. When you are creative enough you can easily find things around the house or something that you can buy cheaply and recreate it into a gorgeous looking piece of art craft that can lighten up any type or house or room that you are in. Among the more popular designs are heart shapes. Hearts give you the impression of showing love, emotion, care, affection and so much more. If you wish to create heart symbols for your home, room or even for special occasions such as anniversaries, valentines and birthdays then you can do so with simple do it yourself heart symbol crafts! Before getting all your materials and avoiding wasting them, you should plan ahead. 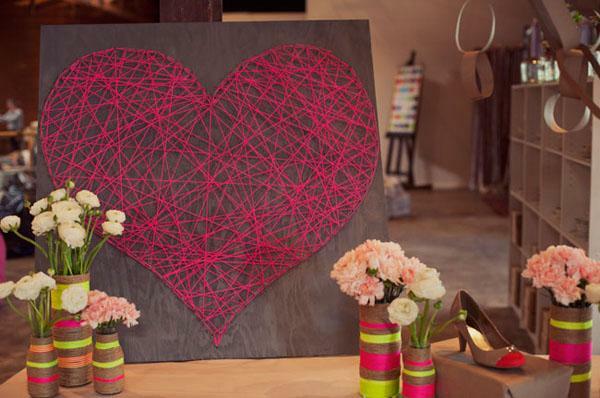 Know what type of heart symbol craft you wish to create. Are you going for paper hearts? Hearts made out of legos? 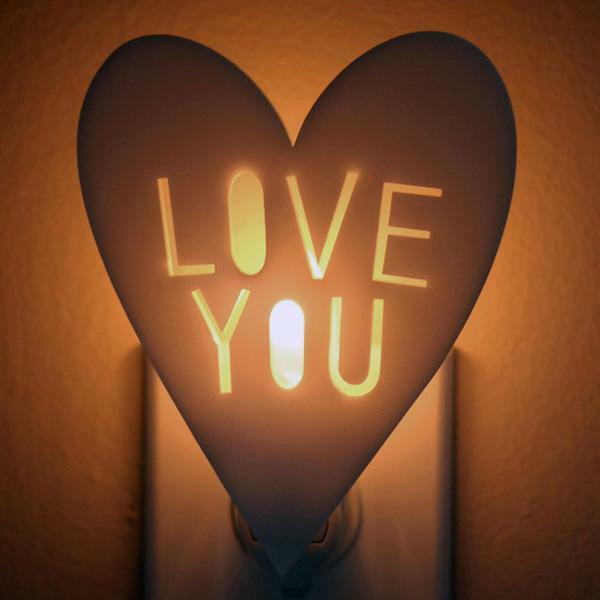 Do you want to make Heart-shaped wood, lamps or beads? The possibilities are endless! Feel free enough to think until you reach the limits of your imagination. After deciding which type of hearts shaped craft you will be doing, try to study how you can create it on your own. There is something personalized when you make crafts yourself and this not only makes you use your creative juices, but it’s also a great way of passing time. You can borrow books from your local bookstore to look up on easy ways to create heart shaped symbols, or you can also go online and search hundreds of blogs that can give you the instructions you need. Once you have this down, you can go ahead and prepare your materials. It’s recommended to just make use of what you have in your home, but for some special pieces you can also buy them and meticulously put them together to create the heart symbols. In other cases people collect the materials they need over time to avoid spending twice the amount; for example bottle caps or empty toilet rolls. Whatever crafts you might be thinking of doing, just be sure that you can spend an adequate amount of time on it and do a thorough amount of research before starting. You can even create amazing heart symbol crafts with your family and friends and turn the craft project into a fun bonding moment. Not only will you be making your place pretty and interesting but you also get to spend the day with your loved ones without having to spend so much as to going out. Be creative; make the best of what you have. 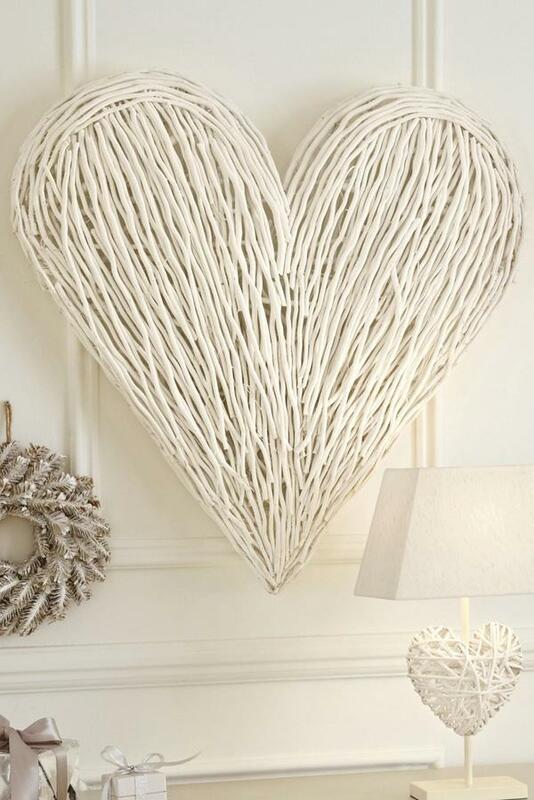 Another wood inspired heart shaped craft that looks very simple yet interesting. 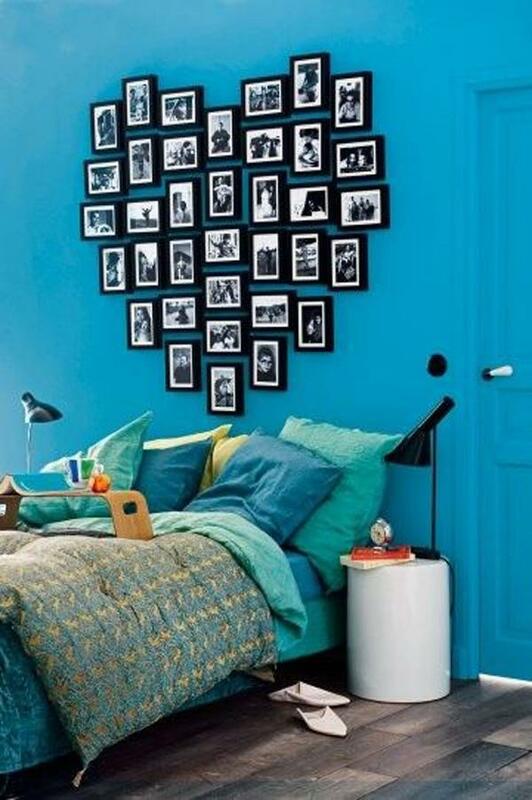 It can be a perfect décor for the wall or can even be made as a frame for your photos. 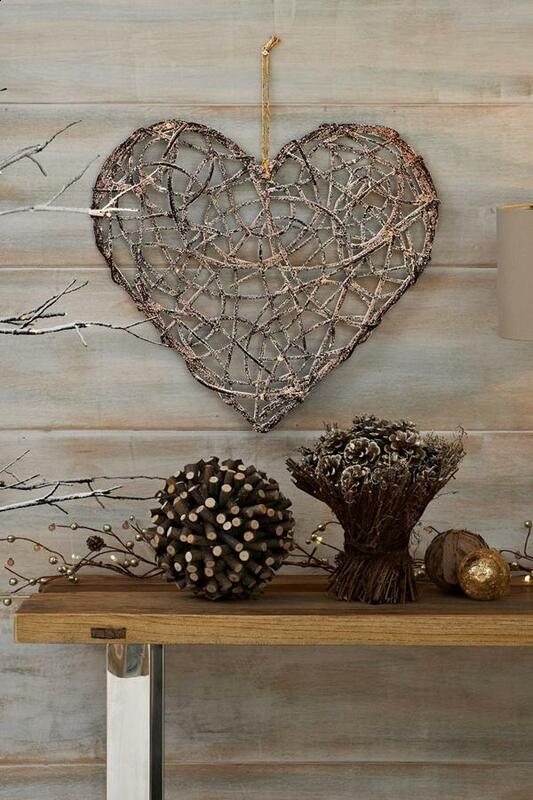 A native inspired heart symbol craft using thin and thick twigs to form a modest heart. 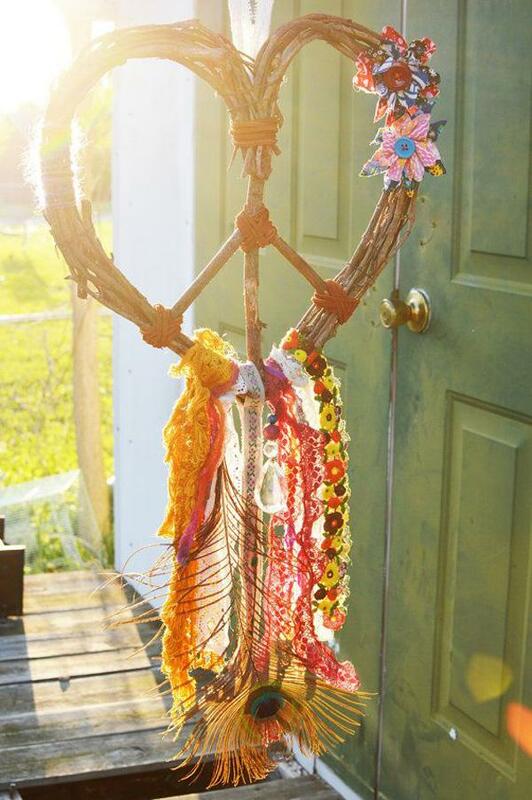 Ropes are used to hold the twigs together and the heart is further adorned by several colorful laces and flowers. Looking very minimalist and clean, this modern furniture and heart inspired lamp looks simply stunning. The words Love You carved across the heart simply give more depth to the meaning that the heart symbol suggests. 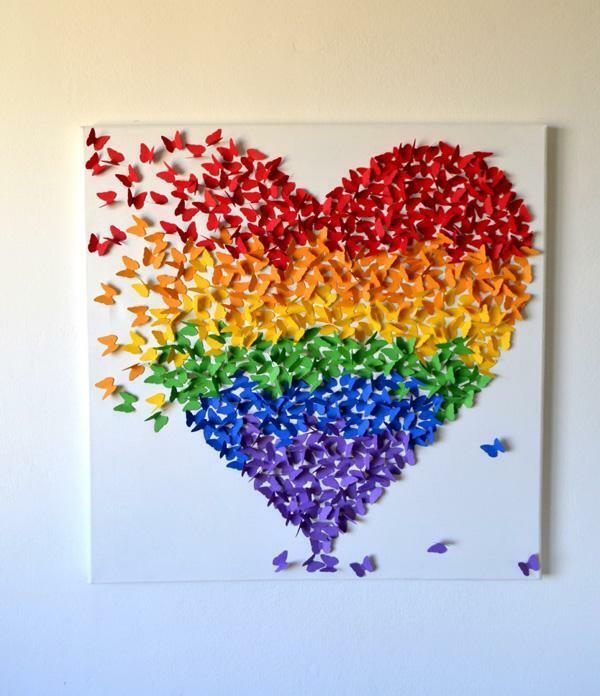 Amazing collage of paper butterflies formed into a heart shape. Combining the colors of the rainbow give an impression of freedom in love and equality. The butterflies also look as if they’re bursting out from the side of the heart on to freedom of expression. Very creative and double purpose. This heart symbol craft amazingly compiles a set of pages from a book and put them together to form a heart shaped mini book. It looks adorable and has a lot of thought put into it. 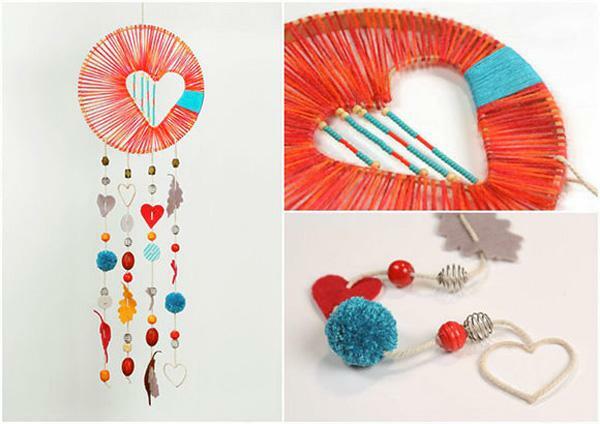 A rather ingenious and creative heart shaped handicraft. The items are something that you can easily find in your home such as wires and beads. You can also improvise by using cheaper beads that you can buy from stores nearby. The minimalist and almost futuristic typography plays with shadows and words spelled love to create an illusion of a heart. More typography on canvas expressing emotions of love and affection. The words vary from capital to small letters to emphasize the weight of the emotion being written on the almost invisible background that holds them together. 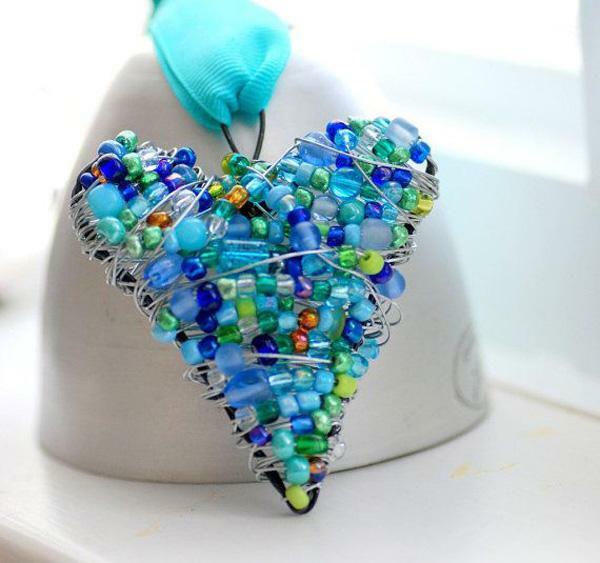 A heart symbol craft using wires and other materials. The gray wires varying from thin to thick sizes have been joined together to form a heart. To finish the effect a ribbon is tied on top and a bird standing on top of a twig with berries. 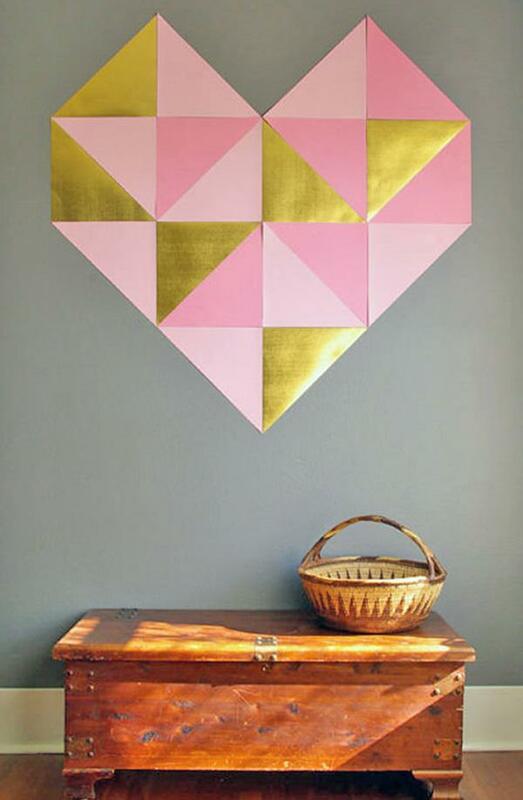 A heart symbol using origami art. It’s a quaint and artistic way of creating a heart symbol and very easy to learn as well. You can make more than one in just a short amount of time. A heart symbol craft playing along a circular skeleton and forming a heart shape inside using yarn and beads. Additional designs such as shells, leaves and miniature heart figures are also hanging below for effect. 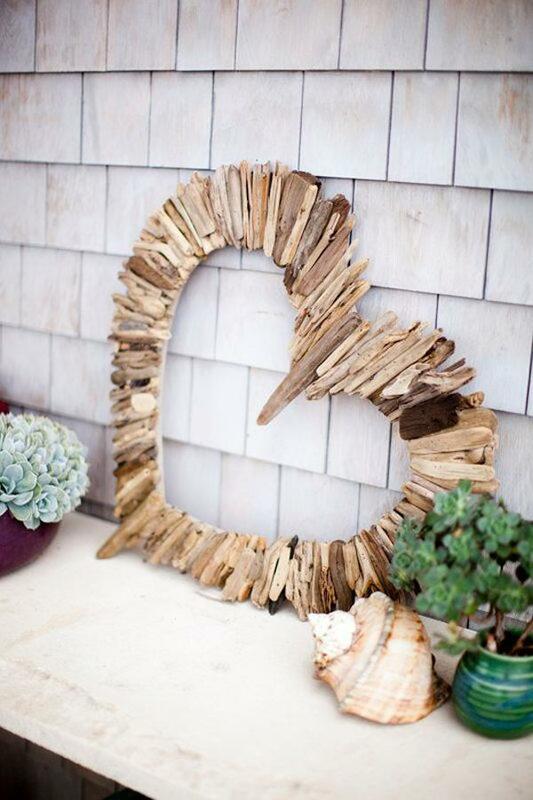 Wooden shaped hearts that have been arranged and bundled together like wind chimes. It gives a very homey and simple vibe perfect for your home along the beach where the wind can dance with it. 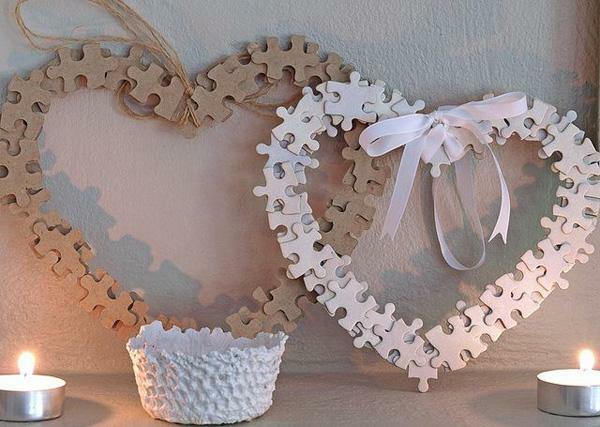 Jigsaw puzzle heart shaped craft. A playful and interesting piece as the puzzle pieces overlap with each other to form layers of heart shapes which is very unique and lovely to look at. 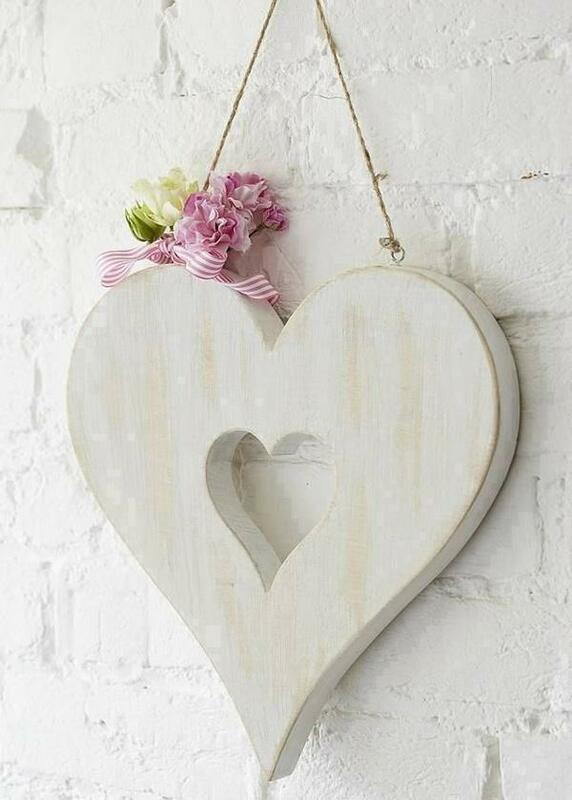 A lovely looking wooden heart-shaped symbol. 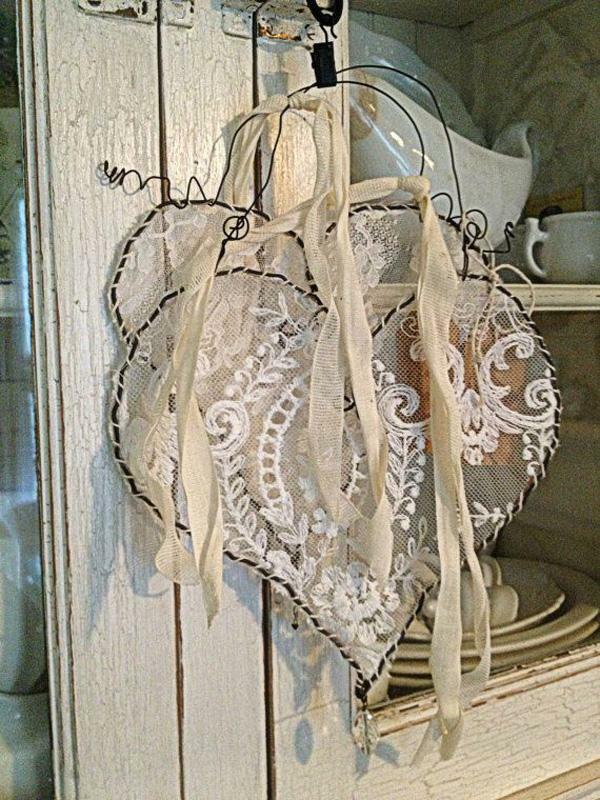 Small little hooks has been attached on the upper sides of the wooden heart for the ropes to pass through and easily hang it on your wall or door. A pretty group of flowers tied together with a ribbon has also been added for effect. A heart made out of thread. Pretty intricate and requires a great imagination and patience to finish. However the result is fantastic and it gives a new meaning to recreating the heart symbol using unique materials. 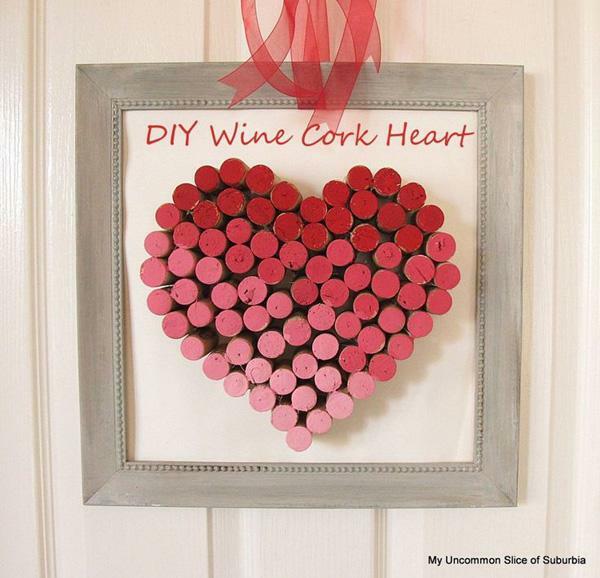 After drinking you might as well as throw your wine bottle cork away, but this heart symbol craft might change your mind. Using corks and painting them with suitable colors, you can arrange them to form a heart symbol to use for your home renovation projects. Talk about a burst of colors. 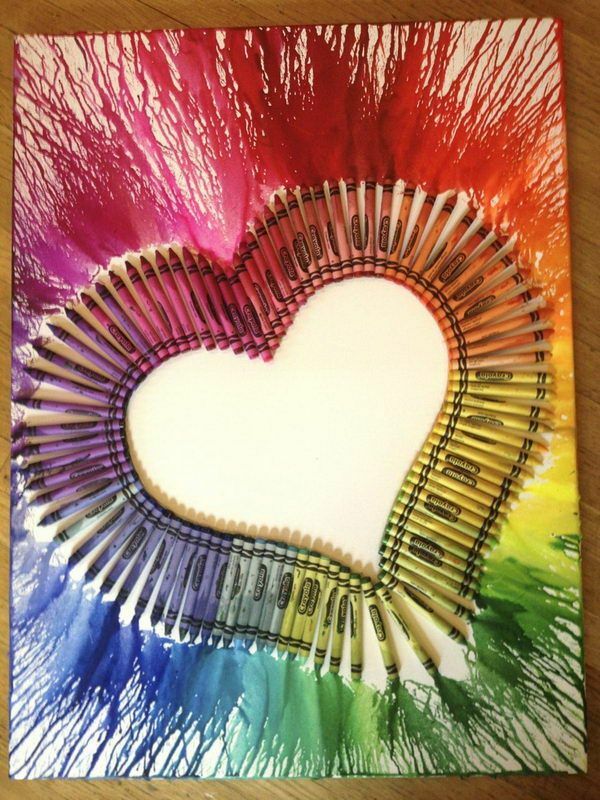 This crayon inspired heart shape art craft is simply stunning and mesmerizing. Gather up your box of crayons and arrange them to form a gradient color for amazing effect. 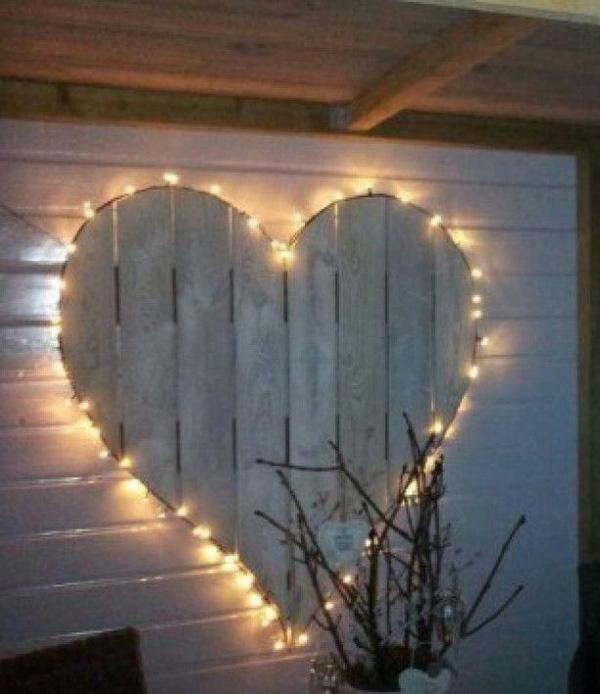 Probably one of the most easy and beautiful heart shape décor. You can use colorful cloth to make your heart shapes more appealing and interesting to look at from afar. Very simple yet artistic way of making the heart shape. An elegant and intricate heart shaped craft. Put on your best crochet skills and try to form a wonderful looking design within the white frames while using your favorite colors. 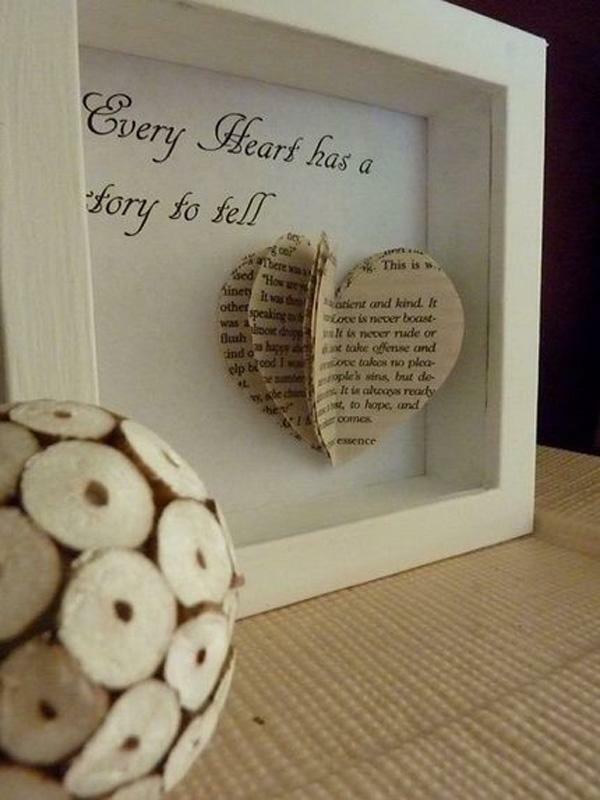 Who says paper hearts are not meant to be forever? This set of white paper hearts with a standout red heart in the middle denotes a deeper meaning with love at the same time giving the illusion of floating off the wall. 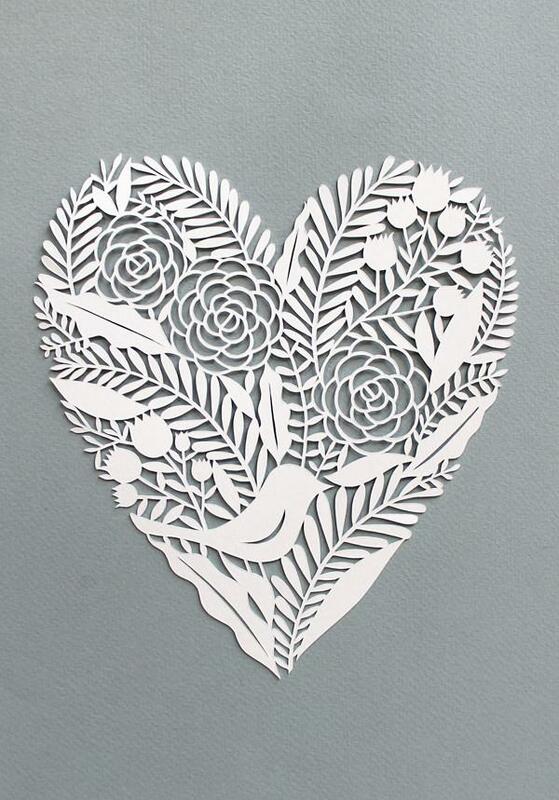 A lovely and intricate heart shaped cut out with more details inside. You can see flowers, ferns and leaves adorning the rather plain and white entirety of the shape. A heart shaped wreath perfect to adorn your princess on the head with. The white flowers go well with the overall pure look of the crown as well as the artistically messy set up of the leaves and vines. 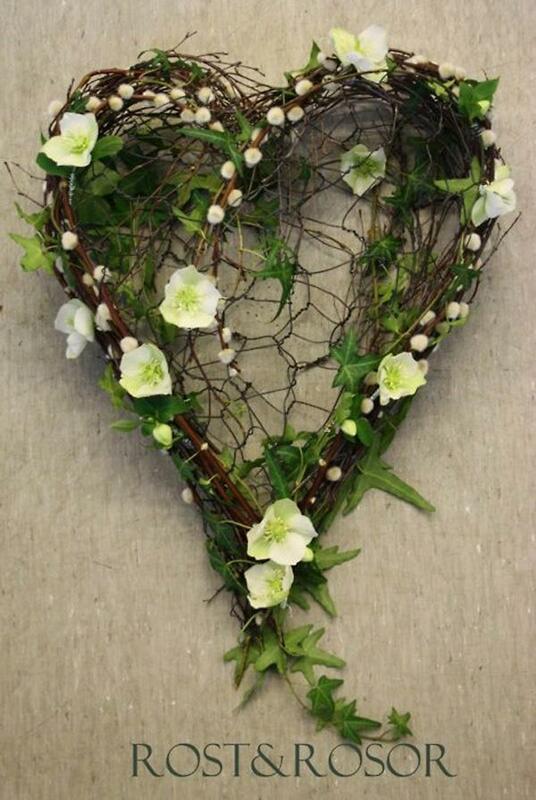 Another heart wreath minus the flowers and incorporating more of the vines and small twigs to form the heart shape. The rather fading color of the wreath gives it a winter-ish look. Do you ever wonder what you should do with your old books? 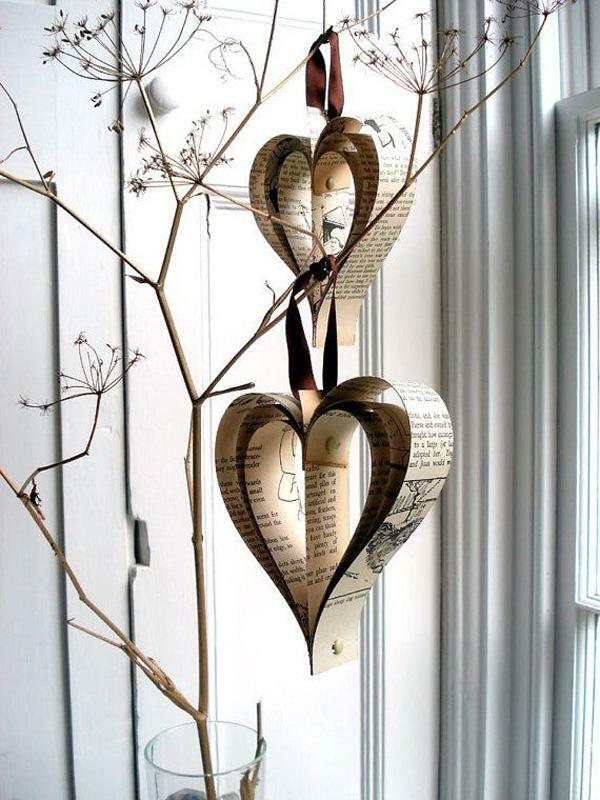 Throwing them away might prove to be wasteful so why not arrange them into heart shaped crafts such as this? Perfect and simple, very easy to make as well. Red colored paper for hearts. As you can see, making the hearts appear 3D like from the wall is a very simple task. Arrange them on your wall as if they’re floating on the air or bursting from somewhere. More artistic heart shaped symbols using paper. 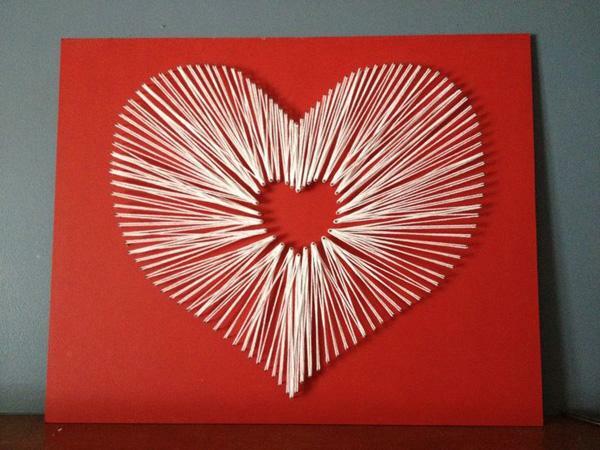 The white piece of paper has been folded and put together to look like it’s endlessly creating a loop of heart. 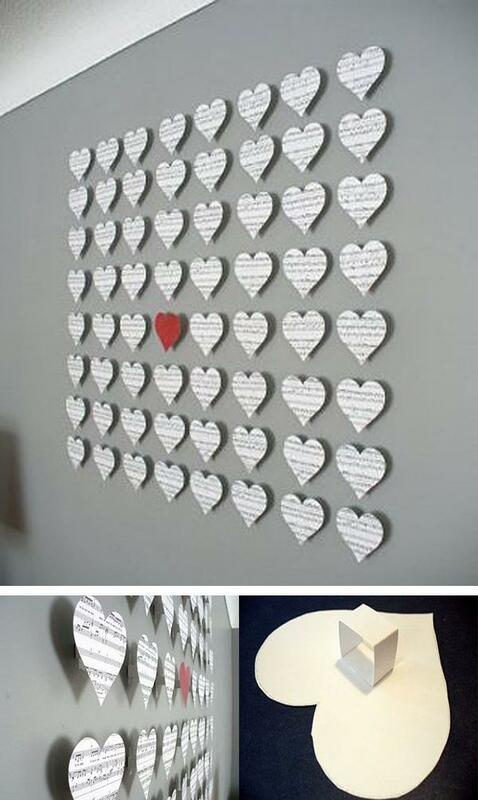 Heart shaped photo frames. Pretty easy to do but the end result is simply great. 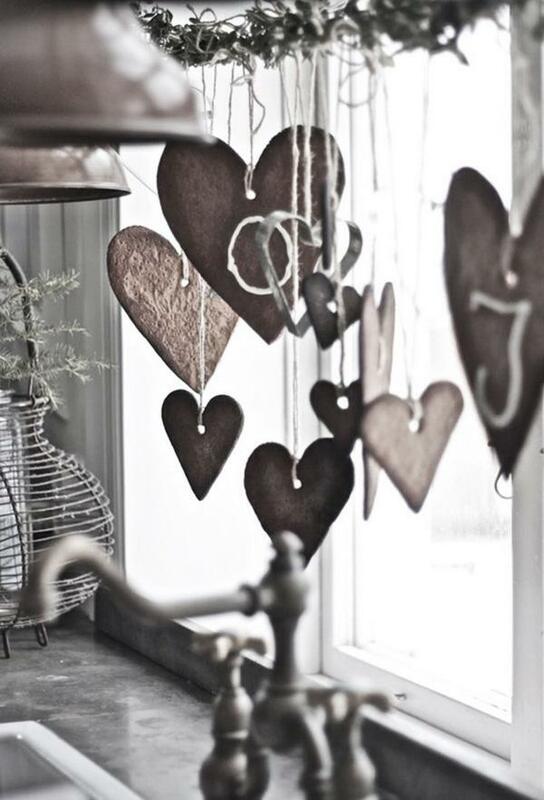 Arrange your monochrome or even sepia inspired photographs, place them in frames and simple arrange them to form a heart symbol. 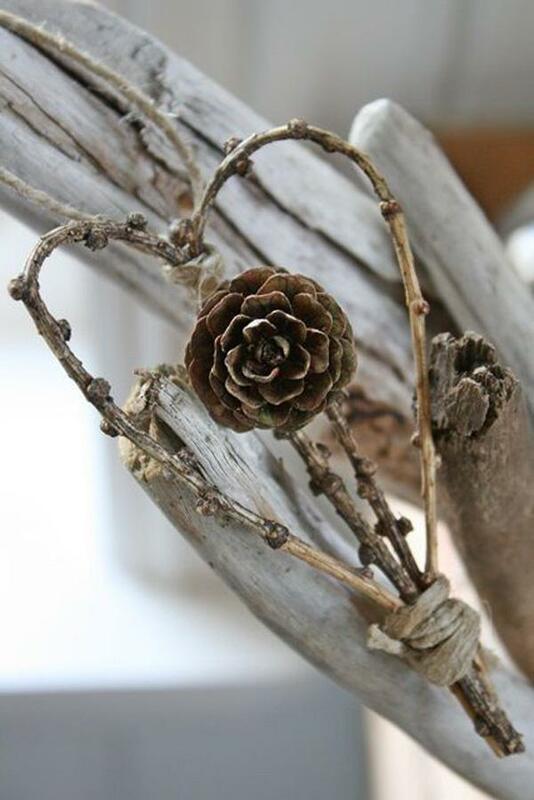 A simple yet ancient looking heart shaped want made out of twigs and a plant. It looks ethereal and what’s best is you can find the materials used in your own backyard for free. 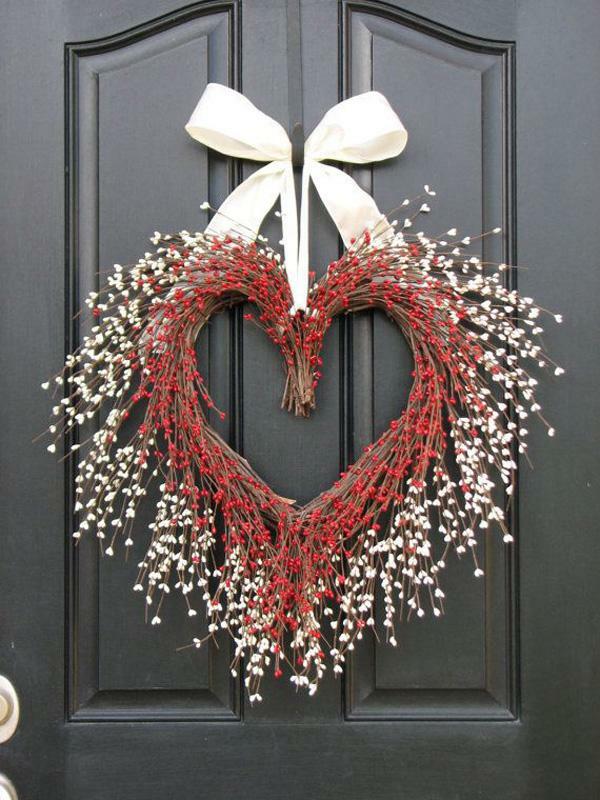 A massive and welcoming door wreath arranged to form a heart symbol. The berries and heart shaped white paper sticking out of the twigs are simply perfect for the Valentine occasion. An adorable looking heart made out of hearts. 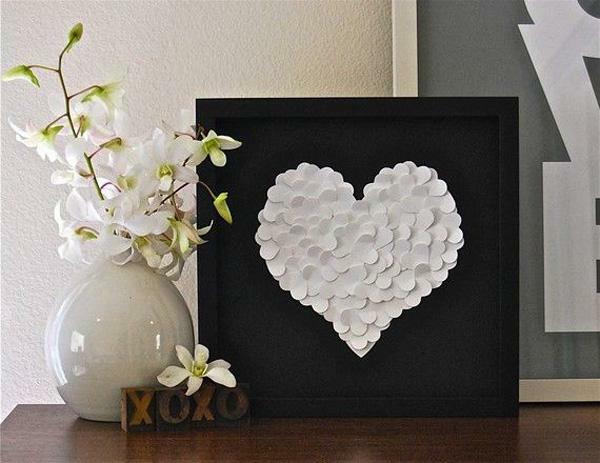 You can use plain white paper cut outs for this heart symbol craft and simply arrange them to form a heart on a contrasting background. 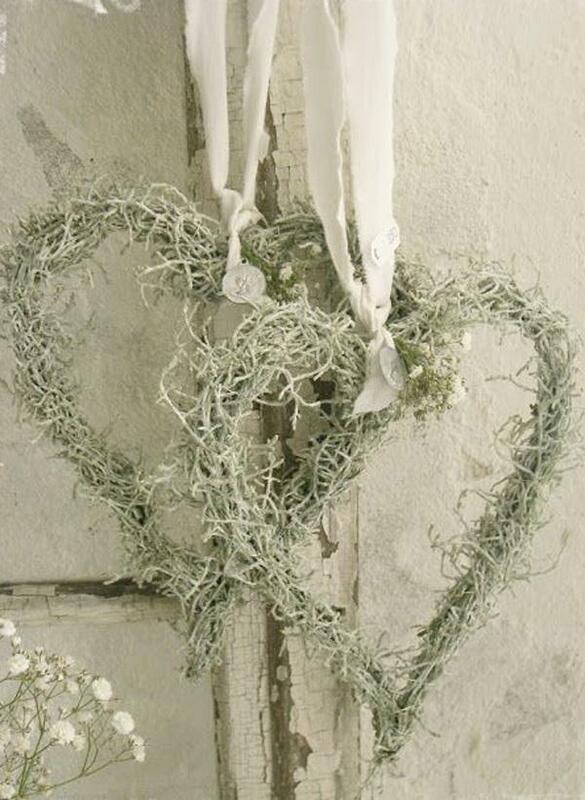 Heavenly white twigs arranged to form a heart. A great outdoor wreath for your country home and it looks fairly welcoming. It looks sleek, clean and most of all simple but eye catching. More from corks! 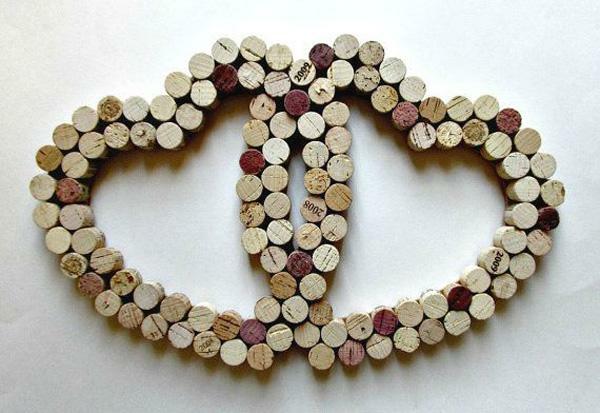 The corks have been arranged to form hearts that collectively intertwine with each other. Pretty artistic and interesting to look at. A group of red tipped corks forming a valentine heart. 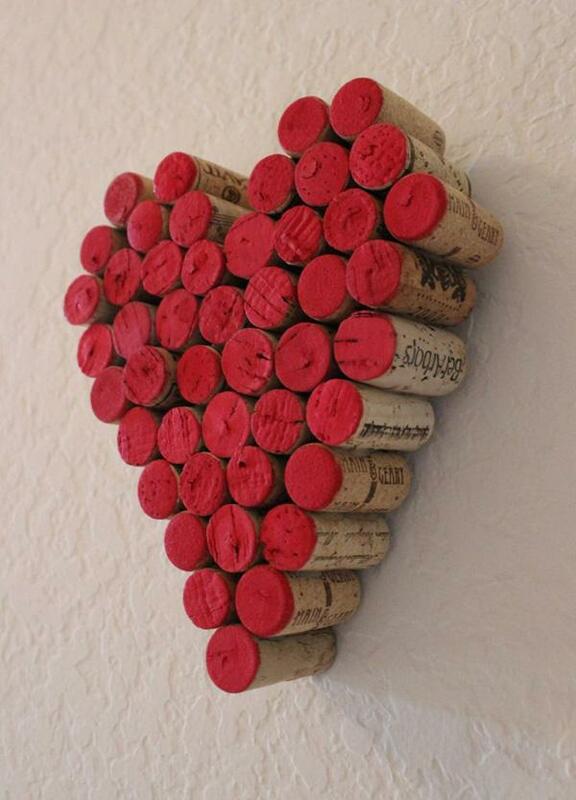 Scale up these corks on your wall as they form a big or small heart just in time for your Valentine celebration. The word stone heart has been given a new meaning; a much better one. You can make this with the help of a closed heart frame made out of wires so that you can keep the stones inside while easily forming the shape.